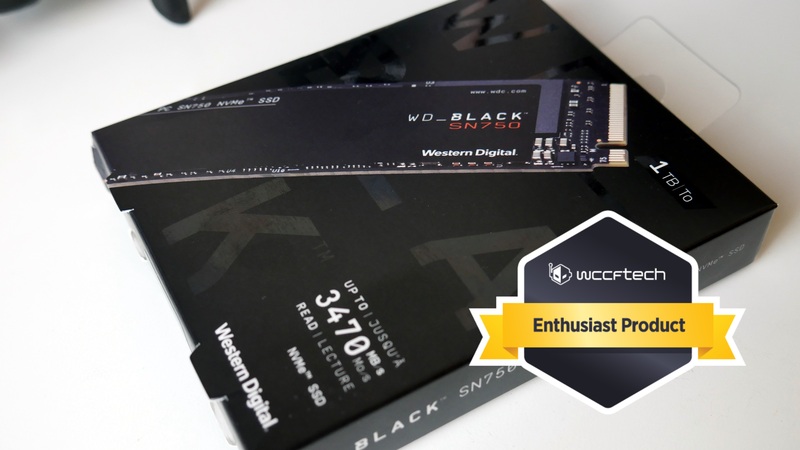 Western Digital has given us a chance to take a look at their new high end NVMe lineup the WD Black SN750. Today we’re looking at their 1TB($249.99) model, but it will also be available in 250GB ($79.99), 500GB($129.99), and later available in 2TB. 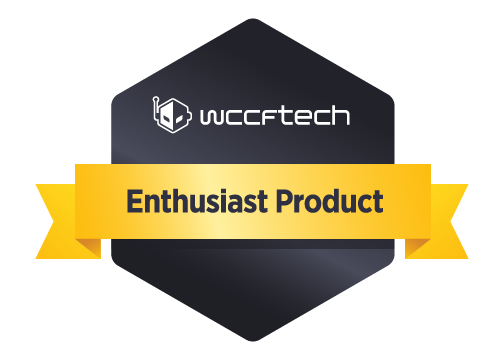 One of the unique aspects of the WD SN750 NVMe drives is the fact that it is 100% built in house, so nothing is sourced elsewhere and that allows Wester Digital to control their entire product stack to fine level that puts them on a competitive level with the other major players in storage. They seem to have made a solid transition into the NVMe world and are competing well last year in that WD NVMe Review. Before we get too far into this performance review I want to point out I have limited access to other NVMe drives but included all that I had in the graphs. As we progress the test pool will increase and more data points will exist. The box is a box, I mean it’s black with some glossy text. Not a whole lot to write home about. The drive itself is nice and black with minimal branding and the text is not so bold that it’s distracting. The good thing about a design like this is just that it’s aesthetically pleasing in a build now that boards are no longer bright blue or green. Since this is my first proper storage review it gave me an opportunity to setup a test bench configuration that would be used going forward. I decided to stick with my Z370 based Core i5 8600K GPU test bench paired with 16GB DDR4 3200 RAM and decided to go sans dedicated GPU. 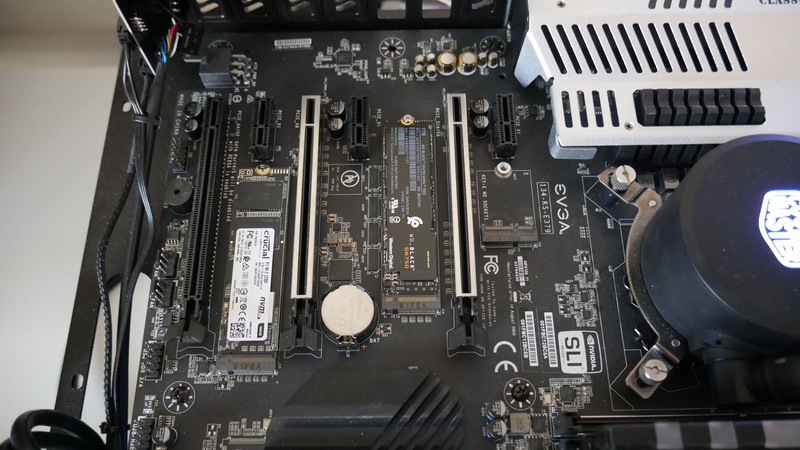 The reasoning for this was simple as I had to remove the GPU to access the secondary m.2 slot so that I could run the tests. Before starting the tests I loaded the NVMe drive up to 60% capacity so that the testing would not be run on a clean empty drive. This is something I plan to do on all SSD tests going forward regardless of size. If you’re sticking to focus on the 1KB Read/Write I could see you turning up your nose, but move it up to 4KB Reads and the story changes massively. 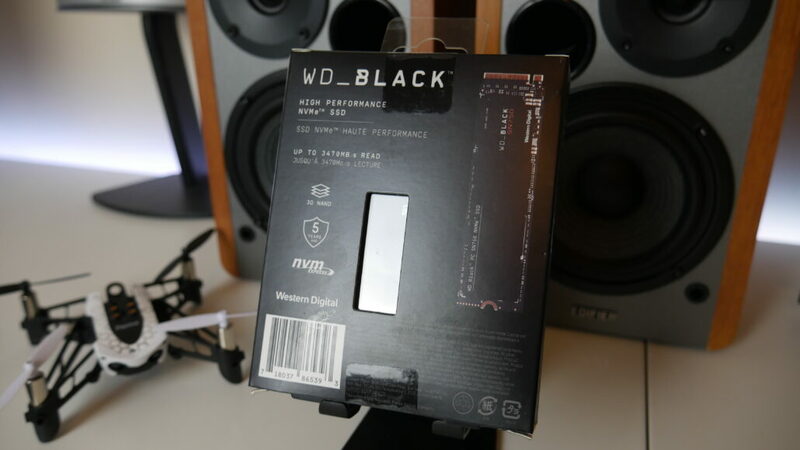 The WD Black SN750 completely obliterates the other drives in the lineup. This is the moment I began to realize just how slow my personal ADATA SX6000NP really is. CrystalDiskMark is a disk benchmark software Made by a Japanese coder named Hiyohiyo and is one of the simplest and most frequently used tests for storage due to its simple and easy to understand UI. It measure sequential reads/writes speed,measure random 512KB, 4KB, 4KB (Queue Depth=32) reads/writes speed,select test data (Random, 0Fill, 1Fill). 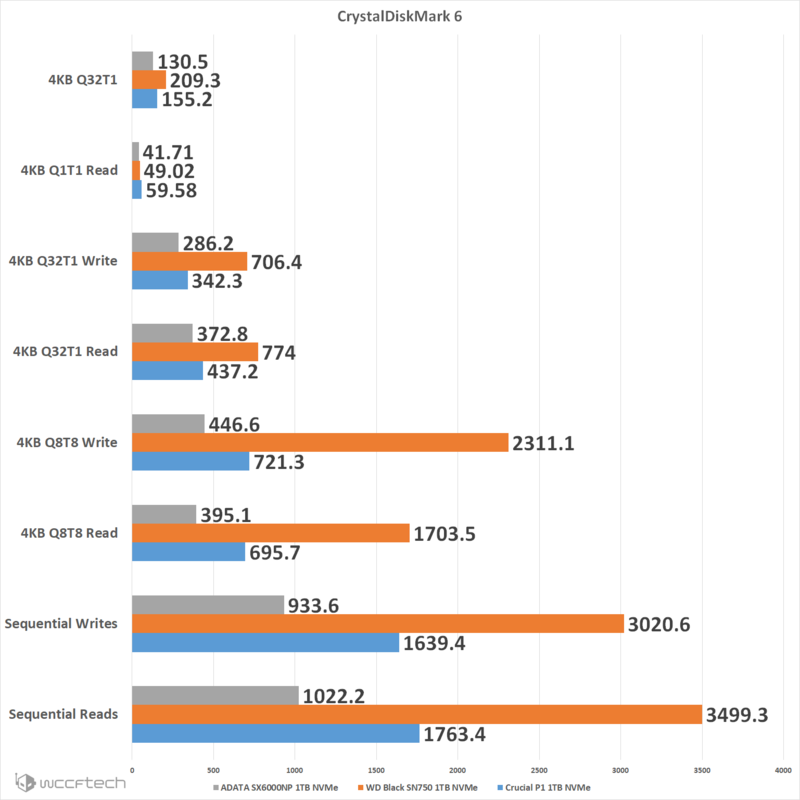 In CrystalDiskMark 6 we see the WD Black SN750 hitting the advertised numbers, validating their claims. 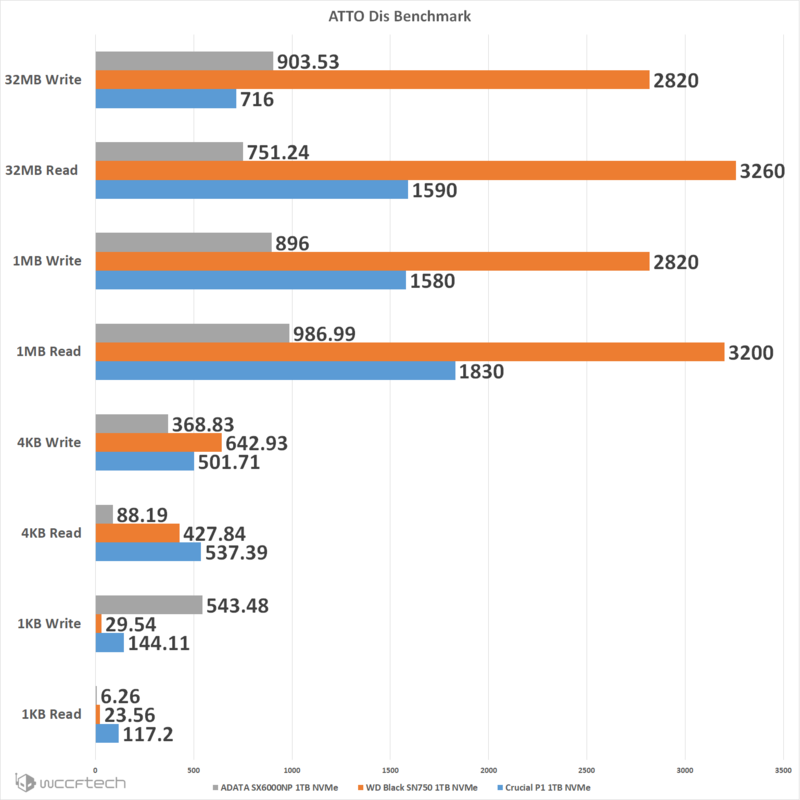 The price disparity between the Crucial P1 and the WD Black SN750 makes a bit of sense seeing the performance delta. 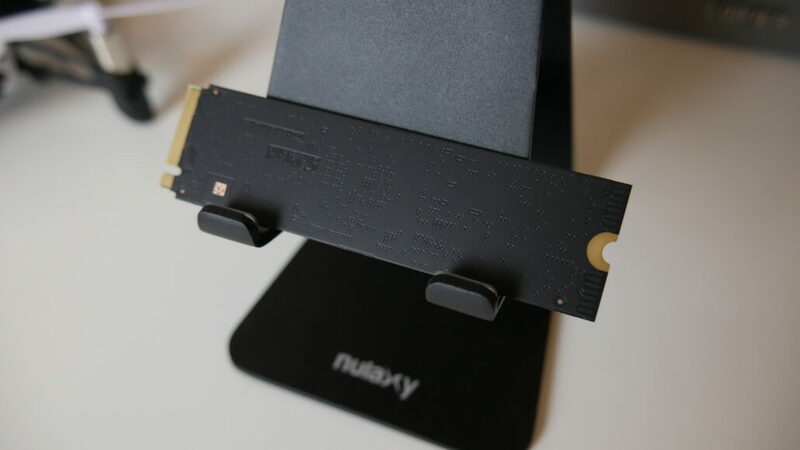 AS SSD is the opposite of ATTO as it uses incompressible data rather than compressible data and simulates the worst possible scenario imaginable for an SSD which gives the best understanding of performance when pushing the drive to its limits. 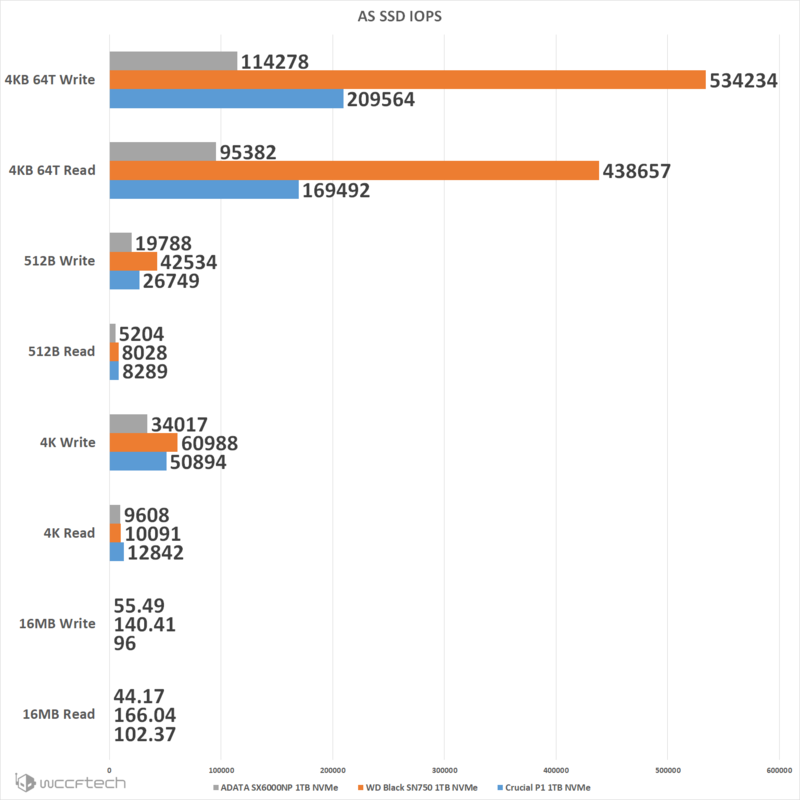 We separate the IOPS and MB/s in the results for ease of reading. 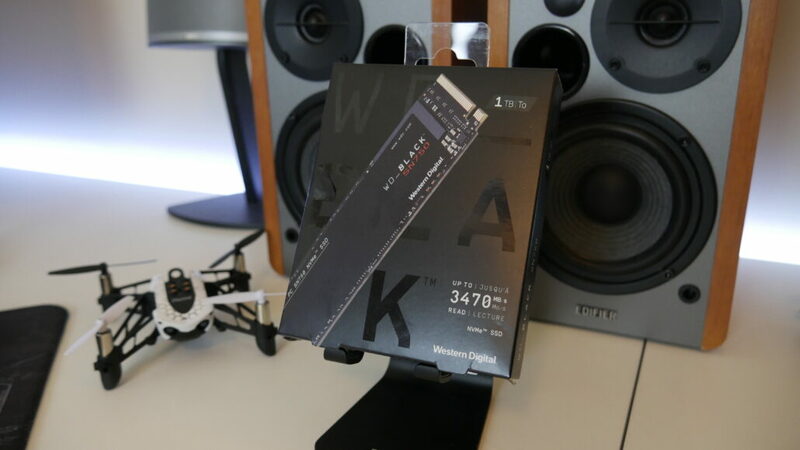 At 4K Reads/Writes the delta between the Crucial P1 and WD SN750 were pretty slim in transfer speeds and IOPS. Once you move past that the same story we’ve seen in previous tests return showing the massive uplift in performance. 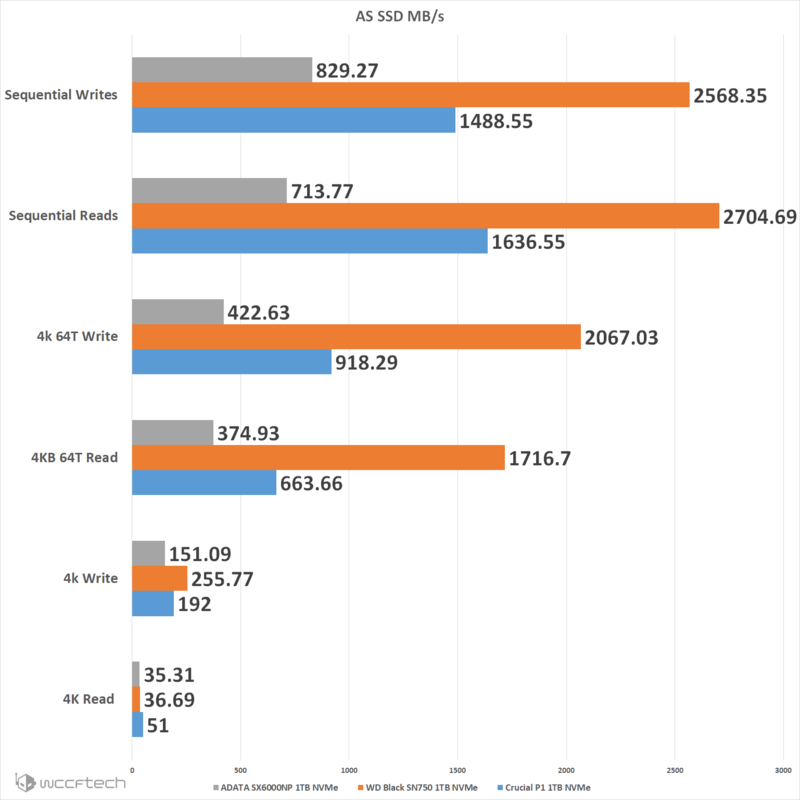 Yet again reinforcing that just because something is an NVMe SSD doesn’t mean that it’s all the same, there’s a lot of room for variations in performance. The SSD Dashboard for the WD Black SN750 is actually a bit more useful that I had imagined it would be. Expecting nothing more than a few toggles for checking diagnostics and the ‘gaming mode’ I was pleasantly surprised to see multiple tabs and so much data given right off hte bat, of course with a helping of WD ads on the sidebar. The front page gives you that ‘gaming mode’ option right away if you so wish to keep the drive from going into low power state so that it’s always at full tilt. 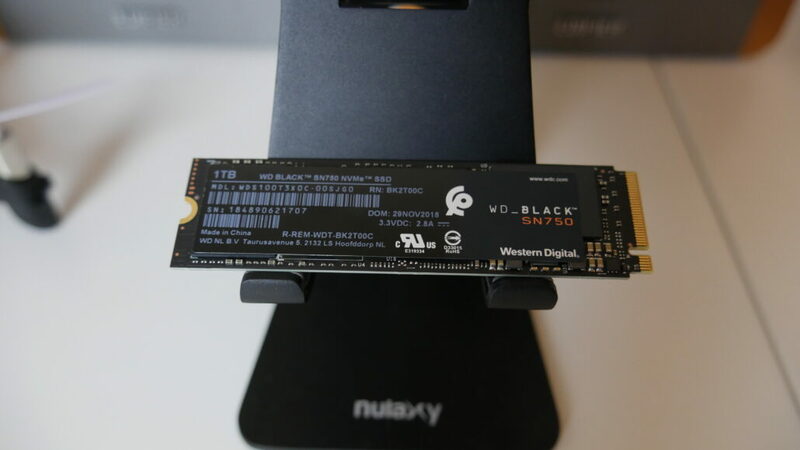 Capacity numbers are right there and a life meter for your drive should help you keep calm down the road if you ever become concerned with the health of your NVMe SSD. This is where we found the drive to idle at 47°C and get upwards to 66°C under load during tests. The Performance Tab is just a constant graph showing Transfer Speeds and IOPS, this was very useful for validating while running the above benchmark tools. Speaking of Tools, the Tools Tab brings all the functions like firmware updating, software updating, diagnostics, and clearing the drive all under one spot. The settings tab lets you choose whether the application starts with windows or not. The Western Digital WD Black SN750 1TB absolutely dominates the NVMe drives that I have been able to test so far. 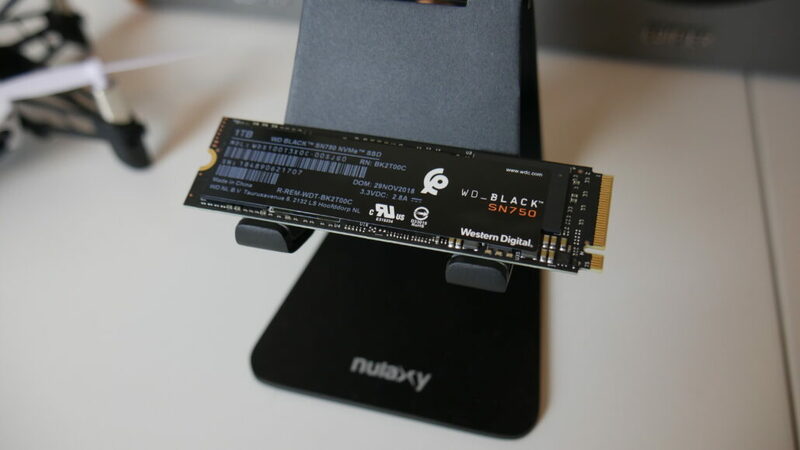 At current pricing the Crucial drive offers good value for money, but even still the price uplift of the WD Black SN750 NVMe is more than worth the asking price with the massive performance boost. The SSD Dashboard is a nice addition and easy to navigate, but I’m not sure how excited I am about the ‘Game Mode’ since, subjectively, I couldn’t tell whether is was active but I would rather leave it on than off. While I can’t make recommendations for or against products I haven’t personally tested I will say in the $250 neighborhood you should definitely have this drive on your short list for consideration, once it launches that is. 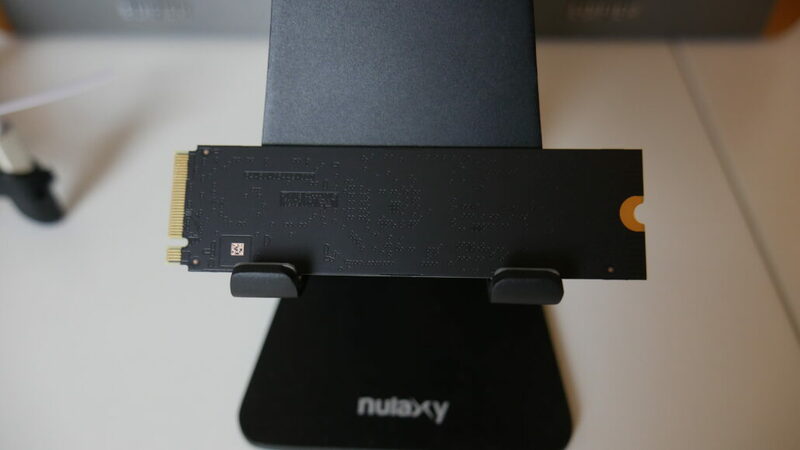 Fast and competitively priced high end NVMe SSD with a solid software suite to accompany it.